The illustrated Forschner Knife Set is the 3 Piece Forschner Chef's Set that includes a (40520) Chef's Knife with 8" blade, a (40534) Slicer with 8" blade, and a (40811) Parer with a 4" blade. Each knife has a blade made of high carbon stainless steel with the Victorinox logo embellishment, and an extremely durable black Fibrox handle that is approved by the National Sanitation Foundation. The Forschner Chef's Set with black Fibrox handles is made in Switzerland. 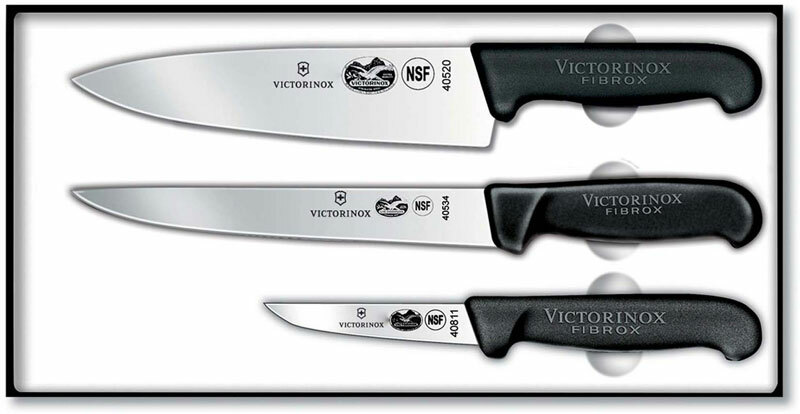 Forschner kitchen knives feature high-carbon stainless steel blades which are hand finished by Victorinox in Switzerland. A special tempering process produces an edge that can be resharpened again and again. All Victorinox handles are ergonomically designed to minimize wrist tension.